The caribou, which is what Europeans call reindeer (Rangifer tarandus), is highly adapted to life on the Arctic tundra. Besides the behavioral adaptation of migrating to escape the worst of the winter cold, they have changed physically, inside and out, to live in this demanding biome. 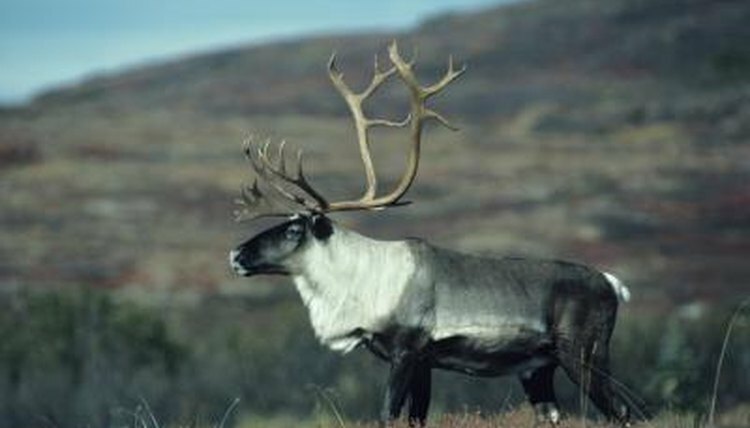 Like many northern mammals, caribou have a compact, stocky body with a short tail and ears to avoid losing body heat. Their skinny legs have veins and arteries that run side by side, so that the heat of the arterial blood coming from the body warms the cooler venous blood returning from the lower legs. Their noses have a special chamber for holding heat and moisture from their exhaled breath to warn the incoming icy Arctic air before it can chill their lungs. Caribou have a double coat, like the Arctic fox. The fuzzy layer next to the skin holds air and keeps the caribou dry when they have to cross a river. Each hair of the outercoat is hollow and filled with air. This trapped air acts as insulation against loss of body heat, as well as making the animals more buoyant when swimming. Caribou have split-hooves, like a cow. They walk on the middle two toes of each foot, which are covered with hooves. Because there are two hooves instead of one as in the horse, they can spread apart to bear more weight without sinking into snow or wet ground, and also act as paddles when swimming. The hooves also change shape with the seasons. In the summer, the fleshy pad in the center grows thicker, but in the winter it retreats and is overgrown by hair, so the caribou walk on the hard horn of the hoof for cold protection and better traction on snow and ice. Even the caribou's digestion has adapted to their environment. During the summer they browse and graze like other plant-eaters, but come winter, they've cornered the market on a food source utilized by no other animal -- lichen. Pronounced "lie-ken," a lichen is a two-part plant-like organism composed of a fungus living symbiotically with a green algae or a blue-green bacteria. Some form of it grows on rocks and trees and sand in almost every biome, and in the tundra it can cover the ground like wall-to-wall carpeting. Caribou can smell lichen under deep snow and use their scoop-shaped hooves to dig down to it. They also have developed special bacteria in their gut that help them digest lichen, and their ability to use this abundant but low-nutrition food helps them survive when there's nothing else to eat. Polar Cruises: Caribou – Truly Arctic Vegetarians? Arizona State University: Lichen Herbarium: What Is a Lichen? Do Elk Have Split Hooves? How Do a Camel's Hooves Help It?